Russian court gives life sentence to lawyer’s murderer | Russian Legal Information Agency (RAPSI). MOSCOW, May 6 - RAPSI. The Moscow City Court has given a life sentence to Nikita Tikhonov, who was convicted of murdering Russian lawyer Stanislav Markelov and Novaya Gazeta journalist Anastasia Baburova. Tikhonov’s common law wife Yevgenia Khasis was convicted of accessory to murder and sentenced to 18 years in prison. 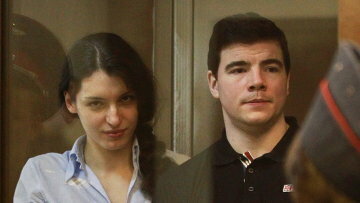 Markelov and Baburova were shot dead in Moscow on Jan. 19, 2009 after the lawyer held a news conference. According to the investigation, Markelov was murdered for his active participation in an anti-fascist movement and for defending individuals against fascism. Earlier, Investigative Committee spokesman Vladimir Markin said Baburova was shot dead as a witness of Markelov’s murder. The court has passed a sentence on the basis of the jury’s guilty verdict. Khasis denied the charges of accessory to murder throughout the proceedings. Tikhonov also pled not guilty to murdering Markelov and Baburova, but confessed to illegal arms trafficking. The defense counsels said they would appeal the decision before the sentence was passed.